A hotline is planned to allow students to get targeted help on the phone. The student advocacy center offers free food and clothing as well as support groups. Ten support groups cater to specific audiences such as veterans and other diverse members with a common interest, such as a poetry support group. Groups will begin meeting Feb. 11, and information can be found in pamphlets in the center. Valerie Villarreal, drug counseling sophomore and work-study student, said one of the most popular programs is the Grab-n-go snack area. Students sign up for the snack program by providing the center their Banner ID number to receive a sticker for the card that will allow them to take one free snack and drink once a day. Snacks could be chips or fruit and bottled water. Another popular program is The Store, the center’s food pantry. Students must fill out a form for access to the store twice a month with the option to fill up to two bags of food per visit. To qualify, students must meet the San Antonio Food Bank income guidelines. The center abides by the 2018 San Antonio income guidelines, which cap income for a one-person household at a $22,000 annual salary. In addition to food, the store provides hygiene products, formula for infants and baby food. “When I started my first semester here, my baby was 9 months, and if I would have known that this was here, this would’ve taken a whole lot of pressure off of me,” Villarreal said. New to the store are refrigerators, which allow the pantry to store perishable items such as meat, dairy products and eggs. The store picks up food orders from the San Antonio food bank every Friday. Villarreal pointed out that though the pantry had been full Monday, it had already dwindled substantially by Wednesday. 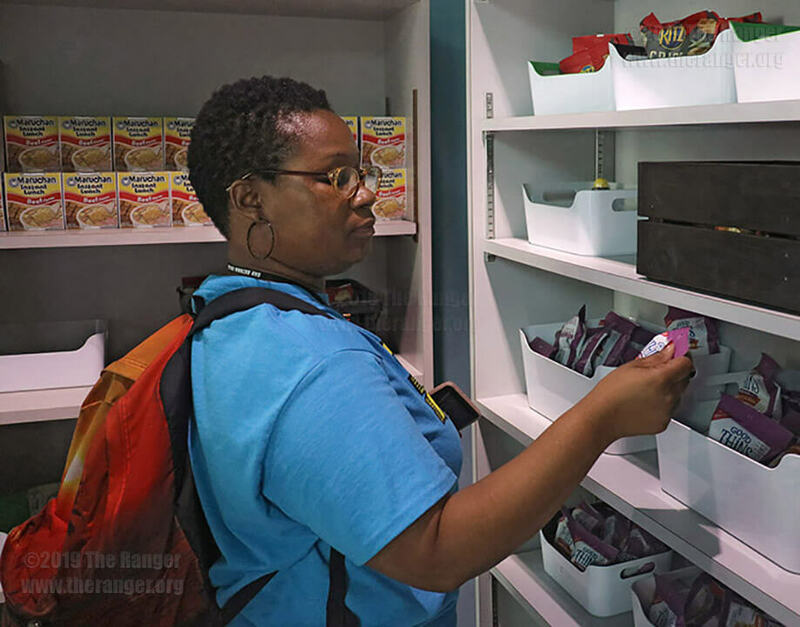 Only students, faculty and staff at this college can use the food pantry. Students from other district colleges are usually referred to their home campus to propel those colleges to start a food pantry of their own, Villarreal said. The program takes donations from the San Antonio Food Bank, H-E-B, faculty, staff and students. Other services provided at the center are The Magic Closet, personal counseling, case management services, emergency assistance, and BAE-B-SAFE. The center plans to convert the phone line to a hotline, which students from any of the Alamo Colleges can call to be directed to counseling. The hotline center will be in the advocacy center and be equipped with 20 desks, computers and phones. Until the hotline is set up, people can call number for the advocacy center, 210-486-1111. The student advocacy center’s hours are 8 a.m.-7 p.m. Monday-Thursday, 8 a.m.-5 p.m. Friday, and 9 a.m.-1 p.m. the first Saturday of each month. The center is between the chemistry-geology building and Nail Technical Center. The building previously was the academic enrichment center. For more information on the advocacy center visit www.alamo.edu/sac/about-sac/college-offfices/student-advocacy-center or call 210-486-1111.